With her fifth solo release Jude Johnstone - Quite Girl, Jude Johnstone has crafted another memorable chapter in her library of songs written as short stories with musical accompaniment. Imposing lyrics, emotionally charged arrangements, and a guest list of musicians such as Emmylou Harris, Clarence Clemons, Maxayn Lewis, Jimmy LaFave, Susan Cowsill, John Cowsill, and John David Souther, makes this release one for the collectors of music with heart, soul, and depth. Jude Johnstone - Quiet Girl was produced by Jude Johnston and Charles Duncan and released on the BoJak Records label and is the fifth release for this talented singer/songwriter/performer; see the Music Scene section to read reviews of Jude Johnstone's Mr. Sun, Blue Light, and On A Good Day. A musician who has had her songs covered by a Who's Who of musicians, Jude ventured out from behind the scene over 8 years ago and has rewarded her growing audience with 5 masterful releases, and Quiet Girl adds to her legacy. The release opens with the title track Quite Girl, which is a signature Jude Johnstone track that combines her triple threat of powerful vocals, emotional lyrics, and an arrangement that culls it all together, as well as a guest vocal appearance by Emmylou Harris. Quiet Girl is a song of love ventured, love found, and love lost; a track that connects with her audience on many different levels. The track I Don't Wanna Go Home features Jimmy LaFave on vocals with Jude as they bring to life the feeling of separation and the pain of going home alone. You can cover up your feelings through friends and a night out, but in the end "I'm still standing in these shoes." Josephina is a song about friendship and about that moment when the bond is needed most, your friends are not there to lean on; a poignant song with an arrangement that carries Jude's touching vocals with a gentle sweep of the drums and the heart rendering echo of the French horn. Don't Wake Me Up, featuring Clarence Clemons on tenor saxophone, captures the fantasy of a beautiful dream that has you smiling in your sleep, of the memories of a special evening and how you wish you could tell those around you "Don't Wake Me Up," let me enjoy the moment for a little longer. Jude's lyrics and arrangement captures the flight of fantasy that happy dreams made from special moments can bring. The song On That Train features John David Souther on vocals and the haunting cello of Bob Liepman. The track "talks" about the desires of wanting, of the decisions that you did not make, and of the excuses made to justify who and where you are; Jude captures where many people find themselves during these tough economic times, as they contemplate the opportunities lost and their future. The song Cry For New Orleans was written for those who have and are still suffering from the tragedy of hurricane Katrina that devastated New Orleans. The arrangement features the moving vocals of Susan and John Cowsill of the late 60's early 70's rock band The Cowsills, who lost their brother in the Katrina tragedy; emotionally charged lyrics that harmonize flawlessly with the musical arrangement. Jude lets her engaging vocals capture your soul on the song Angel At Your Door that also features vocals by Maxayn Lewis. This is one of more engaging songs that Jude has written for herself, and her vocals capture the moment a she sings "There's an angel waiting at your door, and she knows the shape you're in, You can't hide it any more,.... You're gonna have to make a start." The arrangement's use of the organ to complement the vocals is pure magic, as are the segments with the inspiring guitar and drum work that opens up the tempo showing that there is hope. Other arrangements on the release include I Pray for Rain with accompanying vocals by Maxayn Lewis, It's Gonna Take a While, and The Smell of Summer. Jude Johnstone's songs are short stories accompanied by musical arrangements that bring the stories to life. 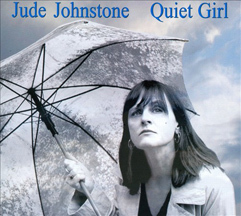 Websites where you can procure Jude Johnstone - Quiet Girl are CD Baby, Amazon, eMusic, Village Records, J&R, F.Y.E. and CD Universe. © March 2011. Luxury Experience. www.LuxuryExperience.com. All rights reserved.